For the uninitiated (somehow, the ecclesiastical word novitiate springs to mind), Robert Bresson must certainly seem the most demanding filmmaker who ever lived. ‘Austerely Roman Catholic,’ as he has so often been characterized, he sought after effects in his work that cannot properly be quantified. Bresson operated under the assumption that there was such a thing as a ‘soul,’ and that, through extreme concentration of style, it could be revealed to the camera and the tape recorder – instruments that, to him, had an almost incantatory power. His films, from the 1943 Les Anges du péché until L’Argent in 1983, were testaments to the austerity of his faith and his equally austere technique. Refusing to yield to anything resembling ‘audience appeal’ or ‘entertainment values,’ he managed to create for himself a quiet, unostentatious niche in the history of French cinema, earning the grudging respect of critics and slowly acquiring an audience of acolytes. Although the film’s theme is religious, it is in no way a strictly religious film. The suffering that the priest endures, and the pettiness and intolerance he witnesses all around are for him simply evidence of the ‘grace’ promised by his faith. And what prevents the priest from seeming like a ‘creeping Jesus’ is that, from the moment we see his face, it is obvious that he is stricken. 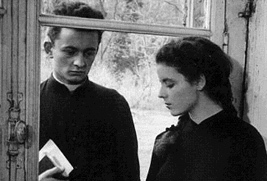 Bresson’s concentration of the gentle and poetic face of his non-actor Claude Laydu – who plays the priest – and his use of the somewhat quaint narrative device of the priest’s entries in his diary, give the film an impetus and a very telling window on the deterioration of his health and mind. In the film’s greatest scene – and one of the most magnificent scenes of spiritual transformation on film – the priest manages to help a woman overcome her grief for her dead child and her hatred of God for his death. Although professedly chary of using symbols, Bresson placed a groundskeeper outside the Countess’ chateau raking leaves throughout the scene – and the sound of the dead leaves being gathered as the Countess at last releases her grief is a powerful metaphor. But even this act of kindness from the priest results in disaster – the Countess dies in her sleep that very night and the priest is held responsible, even by his fellow Priest of Torcy. Bresson is relentless in capturing the squalid daily routines of the provincial setting. Though often regarded as the dramatization of a spiritual journey, the film is remarkably sensuous in its details. Bresson enlisted Abel Gance’s cinematographer, Léonce-Henry Burel, to give the exterior shots (especially the somewhat fantastic night scenes) an especially startling realism. And Bresson’s choice of his non-professional ‘non-actors’ is almost perfect, even down to the casting of the children who themselves cannot resist taunting the priest. Especially noteworthy is Marie-Monique Arkell as the Countess, who would never make another film. Samuels: I think that many of your ideas are a consequence of your Christianity. Am I right in saying that you pursue mystery without worrying that the audience will be baffled because you believe that we all partake of one essential soul? Bresson: Of course. Of course. S: So that every viewer is fundamentally the same viewer. B: Of course. What I am very pretentiously trying to capture is this essential soul, as you call it. S: Do you believe that there is anybody that does not partake in this essential soul. For example, is an atheist outside your audience? B: No, he is not. Besides, there are no real atheists. Charles Thomas Samuels, Encountering Directors (New York: G.P. Putnam & Sons, 1972). Bresson collected his writings in Notes on Cinematography (New York: Urizen Books, 1975).